Posted in: Uncategorized. 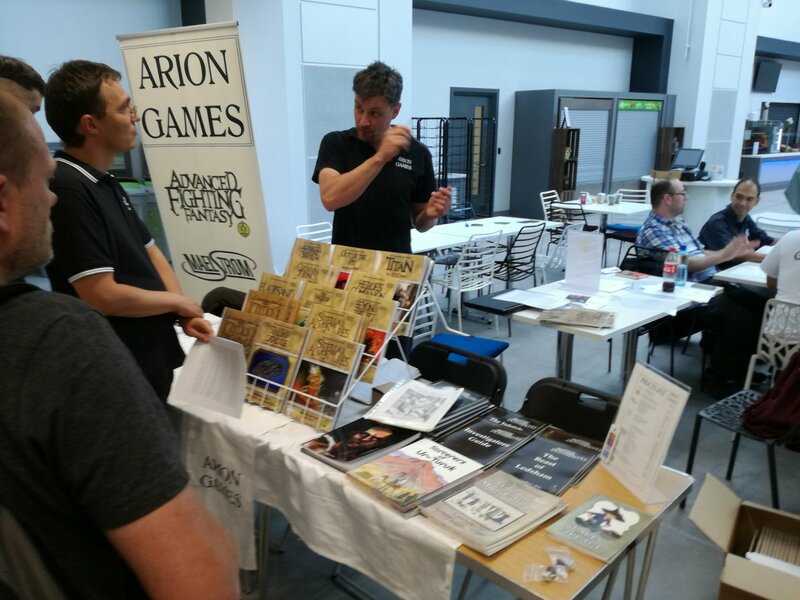 Tagged: AD&D, book, books, Charlie Higson, Deathtrap Dungeon, dungeons and dragons, FFF, fff2, Fighting Fantasy, Fighting Fantasy Legends, Fighting Fantasy Quest, game, game books, Gamebook, gamebooks, games workshop, gaming, Ian Livingstone, Steve Jackson. Tickets are now on sale for the third dedicated fest of the popular Fighting Fantasy gamebook series. CLICK HERE TO BOOK TICKETS TODAY! Posted in: audio drama, Authors, books, Fantasy, game, Gamebook, Gamers, Games, gaming, hobbies, Readers, Reading, RPG. Tagged: adventure, audio drama, Deathtrap Dungeon, Fighting Fantasy, Fox Yason, gamebooks, Ian Livingstone, Steve Jackson. 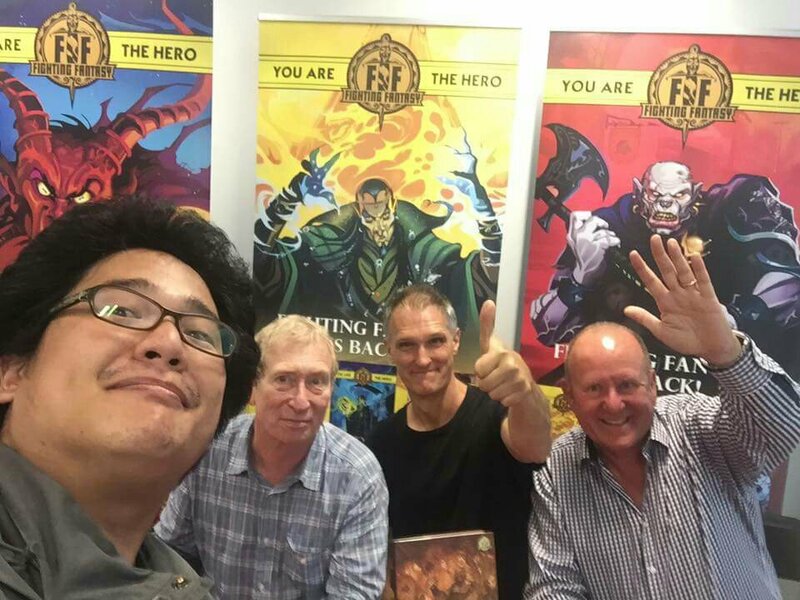 The #FightingFantasy audio dramas increase this week with four new thrilling adventures by Fox Yason Music Productions. FF classics Citadel Of Chaos, Forest Of Doom, Deathtrap Dungeon and Creature Of Havoc have all been given the audible upgrade due to a successful Kickstarter project earlier this year and come together in a lovely box set or via MP3 download. Each adventure follows the adventures of heroes from the first CD The Warlock Of Firestop Mountain and appears to slightly predate the efforts of the hero that actually completes the adventure (the successful readers of the actual Fighting Fantasy gamebook series). Vocal talents such as Rachel Atkins, Richard Rycroft and Lisa Bowerman are also joined by Charlie Higson of The Fast Show fame and author of The Enemy book series and the latest Fighting Fantasy gamebook Gates Of Death. Posted in: Uncategorized. 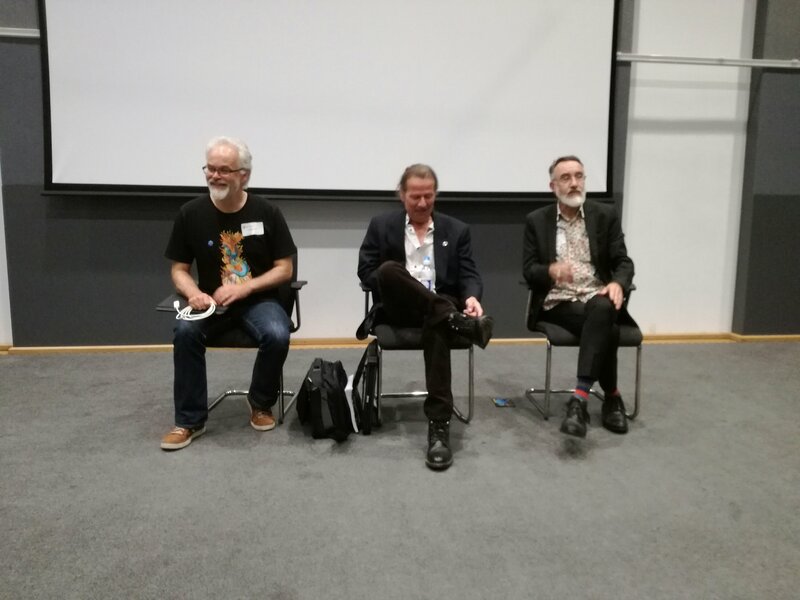 Tagged: Fighting Fantasy, Fighting Fantasy Fest, Ian Livingstone, Scholastic, Steve Jackson. 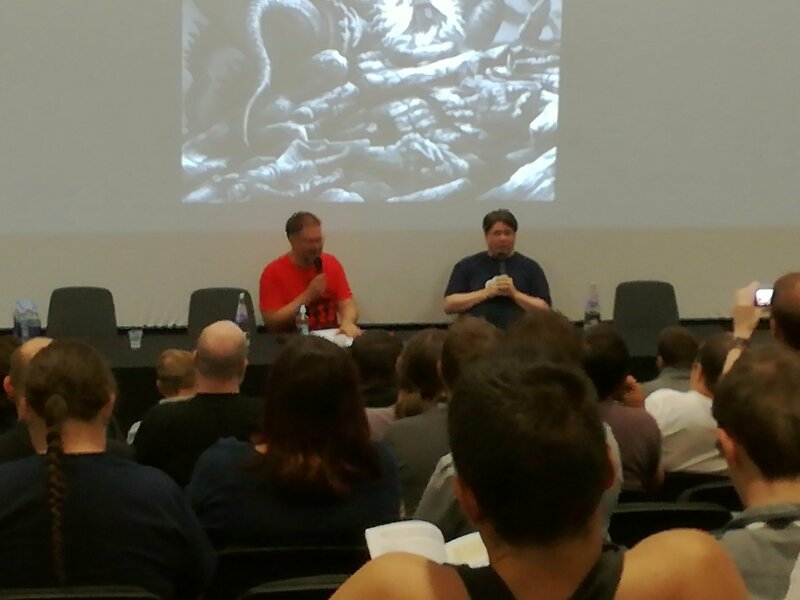 Saturday 31st of August 2019 will see the third dedicated Fighting Fantasy Fest held in Ealing. Will I see you there? For updates visit fightingfantasy.com ! Posted in: adventure, Authors, books, comedy, comics, Fantasy, Gamebook, Gamers, gaming, god, illustrators, Readers, Reading, RPG, Uncategorized. Tagged: Charlie Higson, Fighting Fantasy, Gates Of Death, Ian Livingstone, Steve Jackson. @FightingFantasy – Gates Of Death. The second brand new Fighting Fantasy adventure game book released after Port Of Peril in 2017s Scholastic relaunch of the series. So how was it for me? After an excruciating wait from Fighting Fantasy Fest 2 up until today I finally managed to tread through the latest adventure set in Allansia. 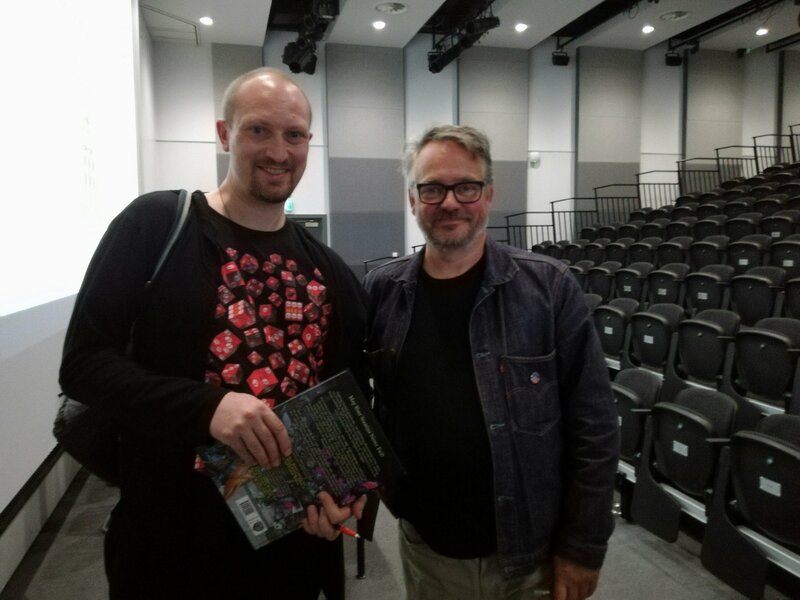 Charlie Higson of The Fast Show fame had been a fan of Fighting Fantasy for years, and has graced us with Gates Of Death, his debut epic for the series. 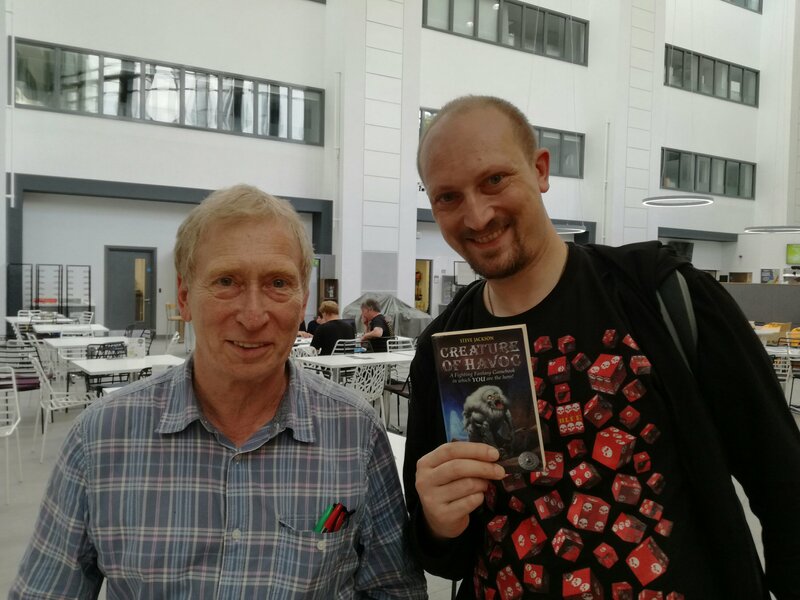 He was invited by FF co-series creator Ian Livingstone to guest write, and has made history as the first guest writer to have his own name on the front cover of an FF book. The celebrity essence may lend the series some pulling power. Now, you may already know that I cannot stand the internal art scholastic has chosen for these books. Little better than cheap grayscale slap dash comic styles, and this book is no exception. It’s a shame because the beautiful realistic illustrations in the classic series is what attracted me to FF in the first place. Thankfully, Higson’s writing hits the nail on the head and saves the book with fast paced scenarios and cleverly interwoven snares for readers to get netted up in. Multi FF author Jonathan Green is said to have coached Higson and this is apparent as Gates Of Death contains a couple of similar elements to Greens work Night Of The Necromancer, although this may be coincidence. One thing I noticed is the fighting aspect is really kept to a minimum. You could always use an alternative to get yourself out of a rut with opponents. I think I completed the adventure with only four actual melee combats. There is plenty of magic to be found and used in this adventure, three pairs of magic shoes for example. I guess he likes giving you plenty of chances to win as you only need one pair! FF is now meant to be aimed at a younger demographic than before, although this book introduces the words ‘bum’ and ‘farting’ into the FF vocab. Not to mention a mutant with two faces on it’s bottom actually illustrated! While it’s clearly meant to bring humour it seems to cheapen the feel of the serious quest. Posted in: adventure, art, Authors, books, comics, Fantasy, Gamebook, Gamers, gaming, hobbies, horror, illustrators, Readers, RPG, Uncategorized. Tagged: Charlie Higson, Fighting Fantasy, Gates Of Death, Ian Livingstone, Scholastic, Steve Jackson. So Scholastic have set the next six #FightingFantasy books into motion. Another five revivals and a brand new title, The Gates Of Death, should be joining us around April. Whilst not many of the die hard fans appreciated the cover art of the first six releases last year, at least they was all done by the same artist and looked generic. Unfortunately we are now met with a change in design. It’s not good. Though one may argue the artwork is slightly more in line with the classic series (I said slightly) , it has been confined to a tiny circle in the middle of the page with about 80% the rest just a single colour broken by white lines. I’m pretty certain this is a money saving device. When you consider the full cover of art we had in the 80s – 00s this isn’t progress nor very eye catching. With the last six covers Scholastic gave the excuse they was using this type of art to appeal to an era of video gaming children. So why the change? I guess they’re admitting they was wrong and the fans we’re right and now going down the cheapest route tasting sour grapes. Posted in: adventure, audio drama, Authors, books, Fantasy, Gamebook, Gamers, gaming, hobbies, Uncategorized. Tagged: audio drama, Fighting Fantasy, Ian Livingstone, Steve Jackson, The Warlock Of Firetop Mountain. #FightingFantasy has exploded back into being in many forms over the past couple of years, and this evening I managed to listen to the audio story version of The Warlock Of Firetop Mountain: The Hero’s Quest. It was rather well scripted, with the vocal talents of Rachel Atkins, Tim Treloar, Toby Longworth and Harry Primus. (The former sounding in my opinion very much like the late Lynda Bellingham). Each track is a new scene of the adventure on the CD, as we follow Vale Moonwing and her unwillingly aquired companion, Cassius Stormblade, through the mountain to defeat Zagor the Warlock. It is rather true to the gamebook from which it is based with crowd pleasing appearances from familiar monsters. FoxYason Music Productions LTD have proven they can churn out a great audio adaptation of the popular Fighting Fantasy series’ first adventure, so it will be very interesting to see if they can bring on other gems including the ever popular Deathtrap Dungeon or hotly under-used House Of Hell. Posted in: audio drama, Authors, books, Fantasy, Gamebook, Gamers, gaming, hobbies, illustrators, Readers, Reading, RPG, Uncategorized. 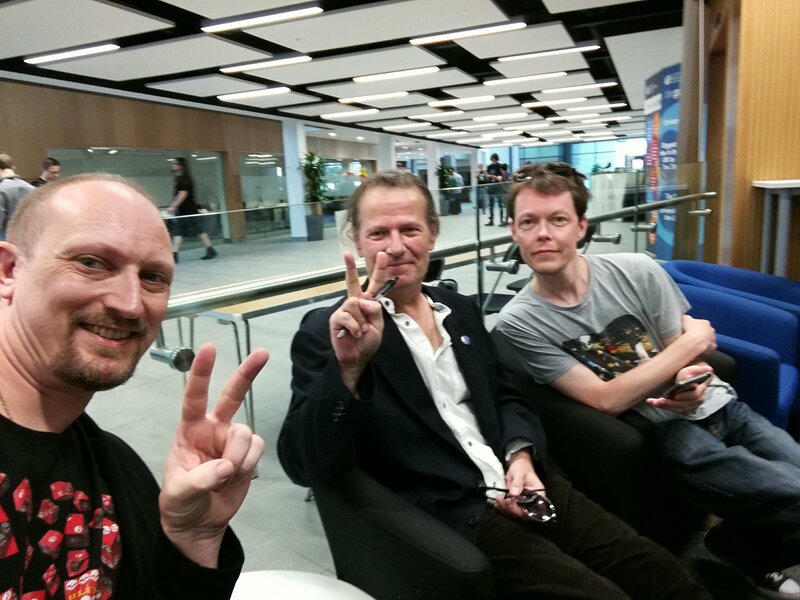 Tagged: fff2, Fighting Fantasy, Fighting Fantasy Fest 2, Ian Livingstone, Jonathan Green, Steve Jackson. It’s September 2017. 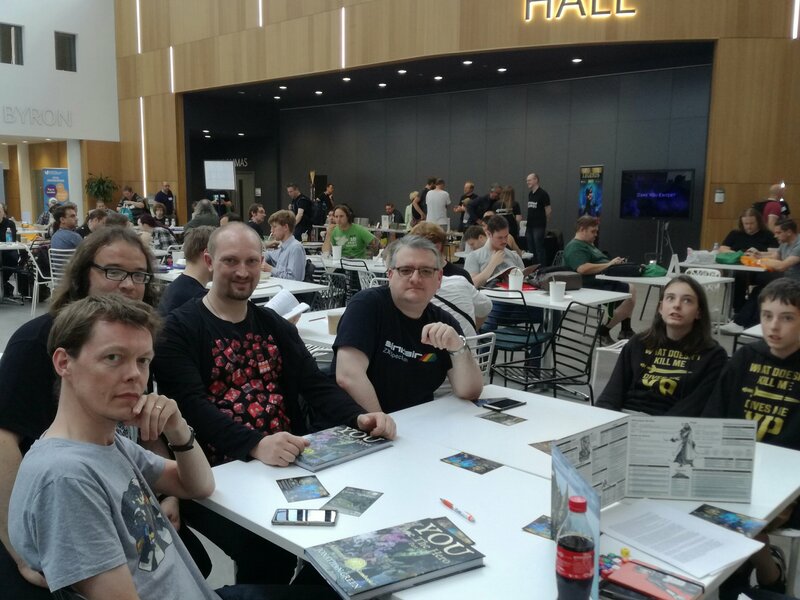 For the second time, brave adventurers and traders from all over the world were summoned to Ealing, London to take part a new Fighting Fantasy Fest organised by FF author Jonathan Green. The promise this time was ‘bigger and better than before’. And was it? In a word, yes! 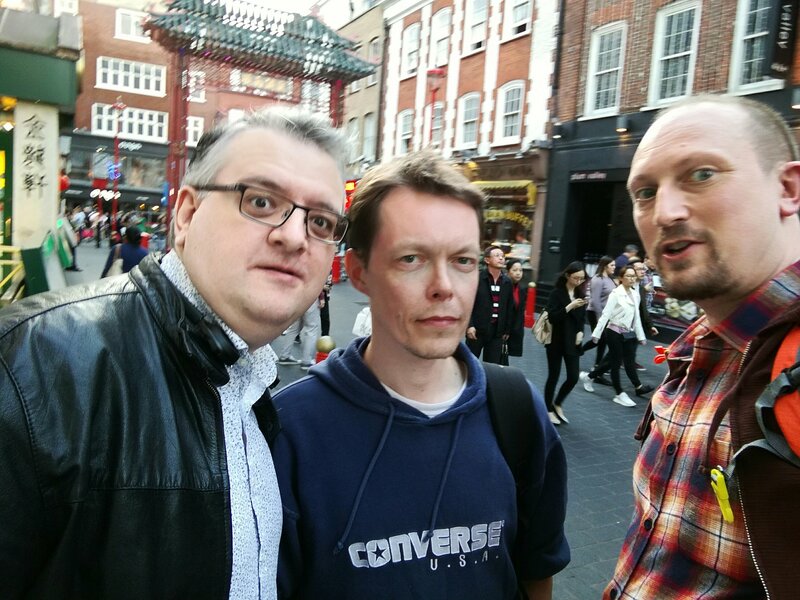 The Demonic Three aka Steven Leicester, Mark Lain and myself met up in Chinatown the night before for a catch up, meal and to take part in an Escape Room game by Hinthunt which we had organised many months before. The following morning with our heads still buzzing from the night before, we catch the tube train to Ealing and coincidentally rendezvous with FF illustrator Malcolm Barter whereby we journey together the rest of the way to The University Of West London where the event takes place. Jonathan Green is at the first display, signing away madly at You Are The Hero Part 2 copies that had only arrived hours before and he hurriedly dished them out to backers as they turned up. After he hands my copy and asks how fatherhood is treating me in reference to my baby, Cassia, a familiar face approaches. 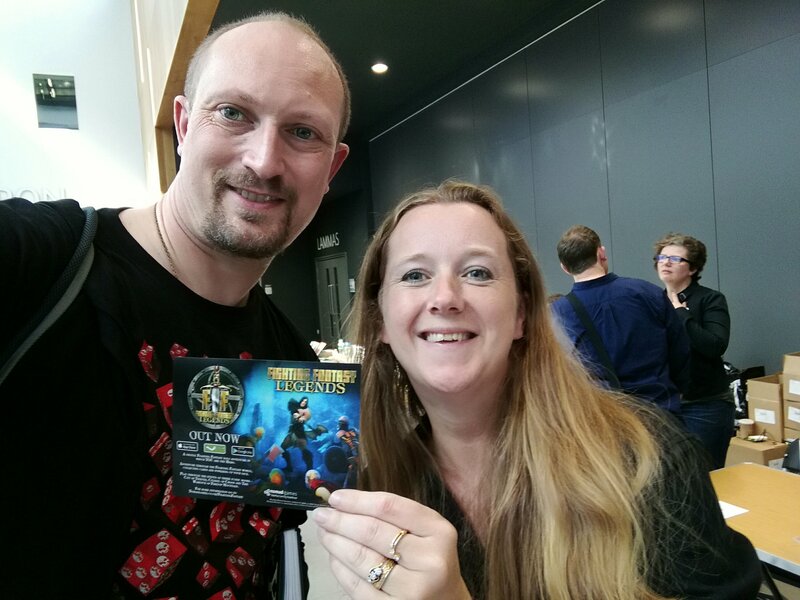 The former comissioner of Fighting Fantasy books charming Geraldine Cooke approaches and we greet each other going into conversation about how wonderfully strong the series has remained in the hearts of fans, old and new alike. She particularly liked my t-shirt emblazoned with red dice. 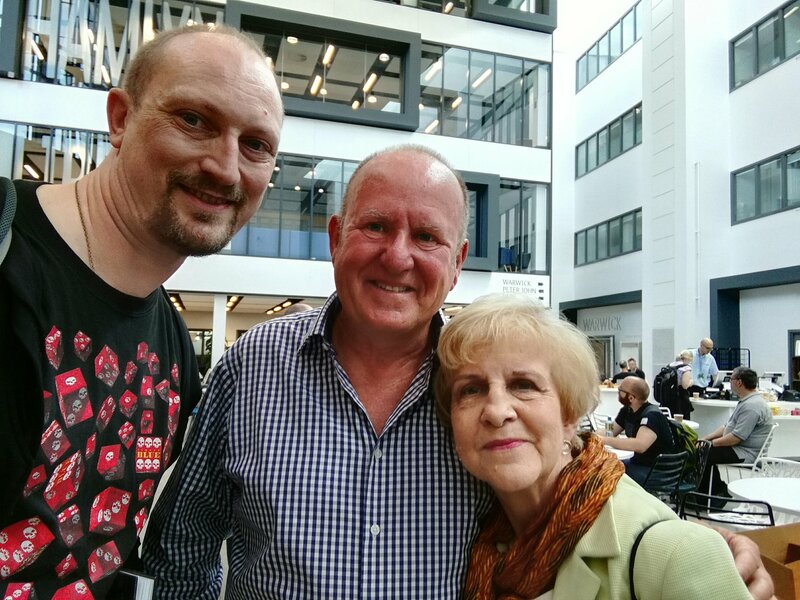 Casually strolling towards us the co creator of Fighting Fantasy, Ian Livingstone joins in our chat clearly equally pleased Geraldine had shown up. I seized the opportunity to grab this picture. 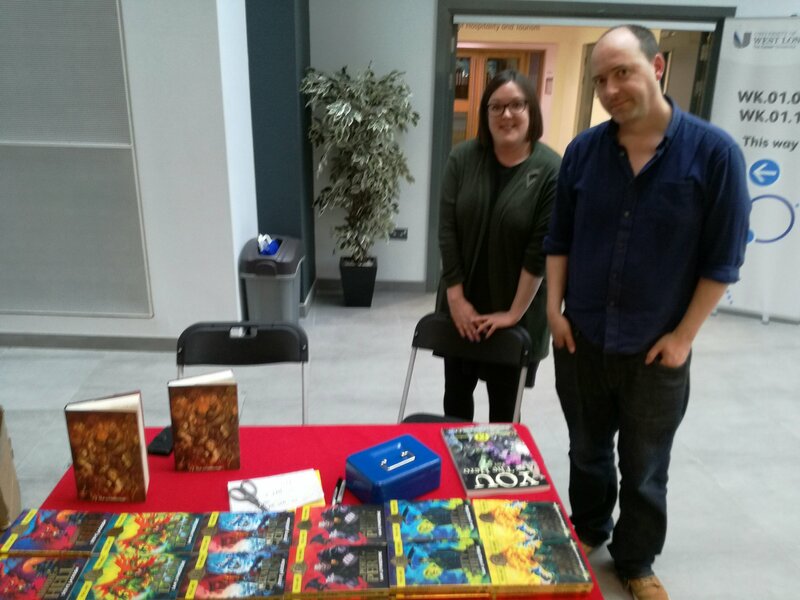 As the next hour or so continued I would visit the traders tables of Jamie Fry, James Schannep and Fox Yason Productions LTD, the latter of whom have produced an audio adventure set in Firetop Mountain. CLICK HERE for info. Nomad Games was also there promoting their new app Fighting Fantasy Legends. 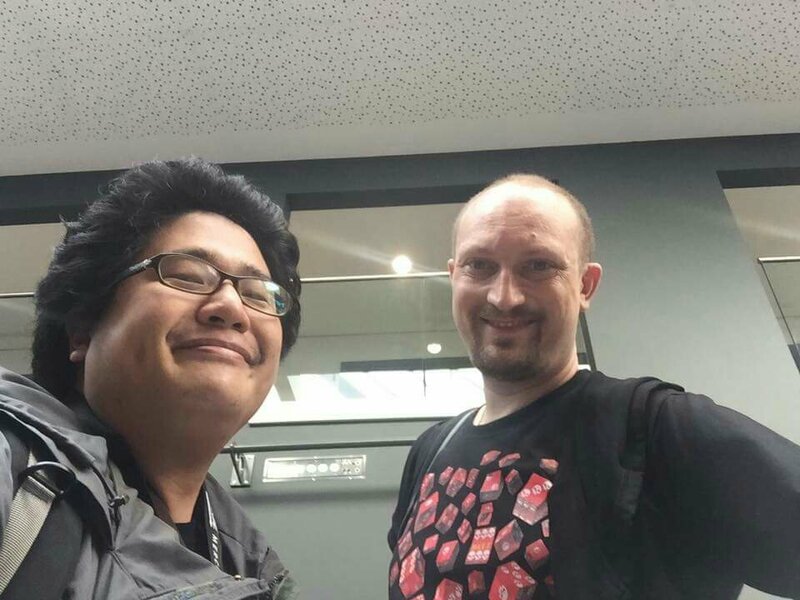 Also browsing was my hero Mr Liren Lin who had flown in all the way from the other side of the globe, and he took our photo after a nice catch up. Slowly more and more friends from the Facebook FF group gathered as the morning went by. 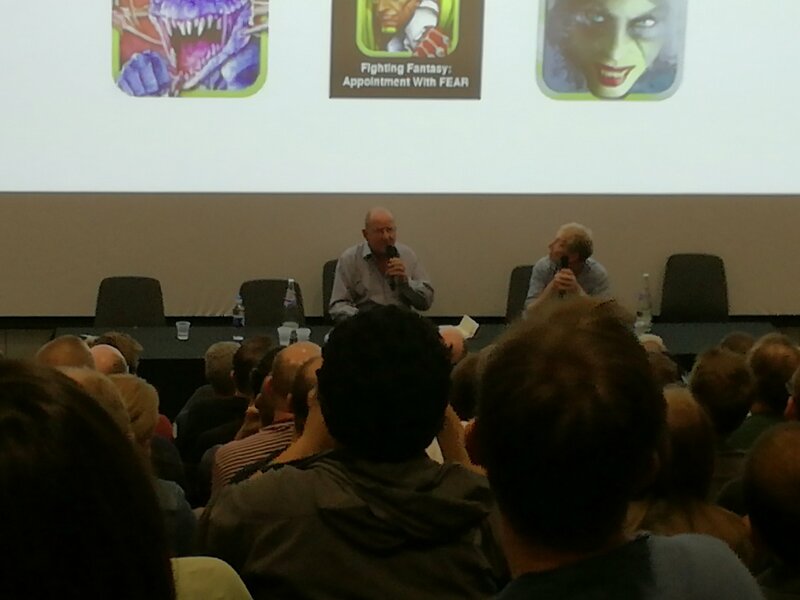 Ian Livingstone and Steve Jackson give a talk about Fighting Fantasy and where it is going in the future. Scholastic has now taken over as publishers and a big announcement was made which made the room fill with excitement. A brand new book will be released in 2018 written by none other than FF fan and star of The Fast Show, Mr Charlie Higson!! One of the biggest privileges this day was to have the illustrator Iain McCaig. He was one of the earlier artists of the series and of the recent limited edition Port Of Peril covers. 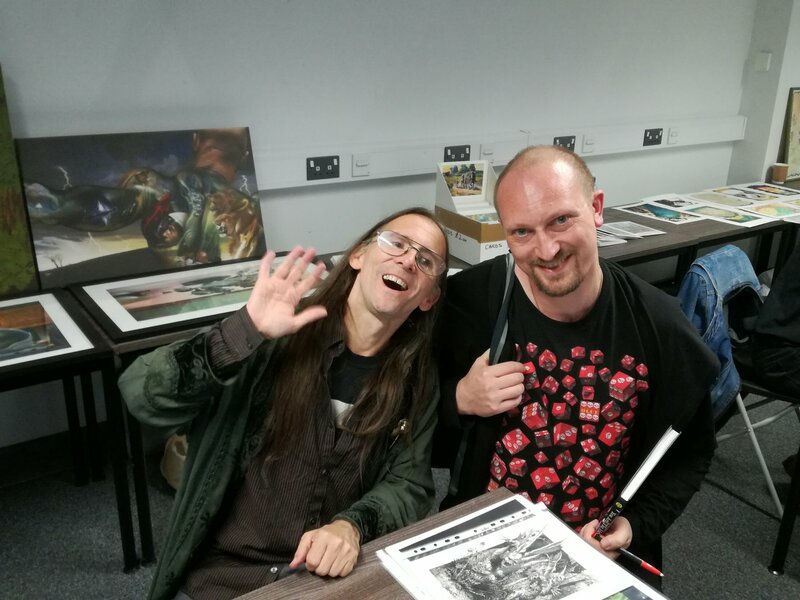 Since Fighting Fantasy he has gone on to become an artist for Hollywood, and is widely famous for designing how Darth Maul and other characters would look in the Star Wars franchise. Here he is in a photo by Liren, I hope you don’t mind Liren but your photo was better than mine lol. Of course the proceedings are not just about meeting stars but also interacting. 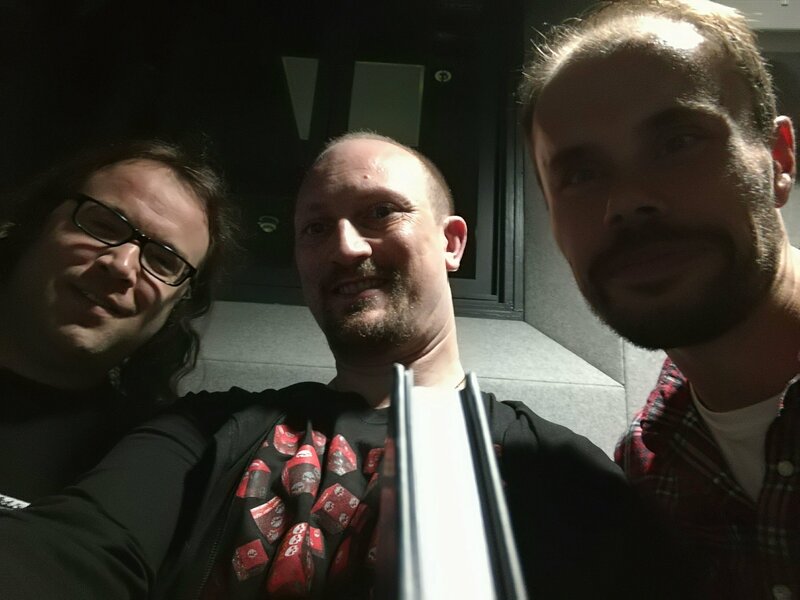 So the Demonic Three and two extra all gathered round for some Advanced Fighting Fantasy fun held by Arion games. All too soon it was time to leave. 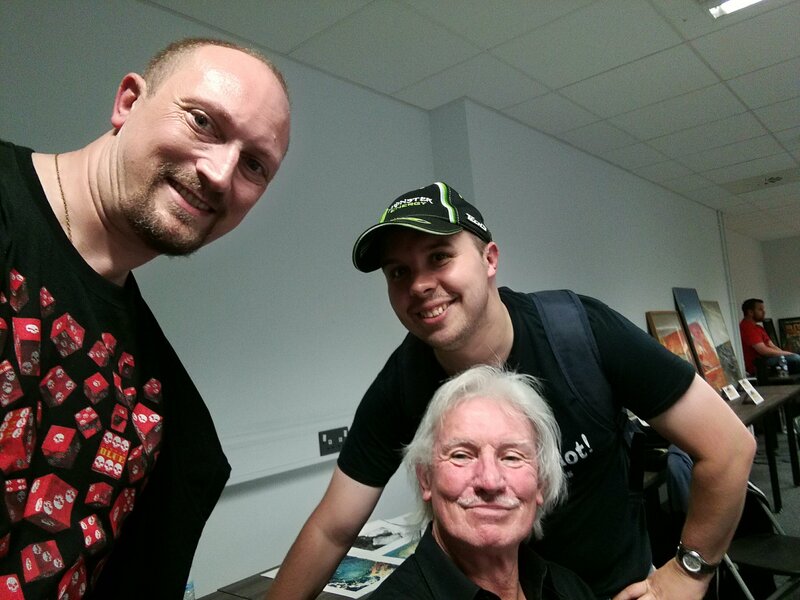 But once again Fighting Fantasy Fest was a triumph for all fans of the series. 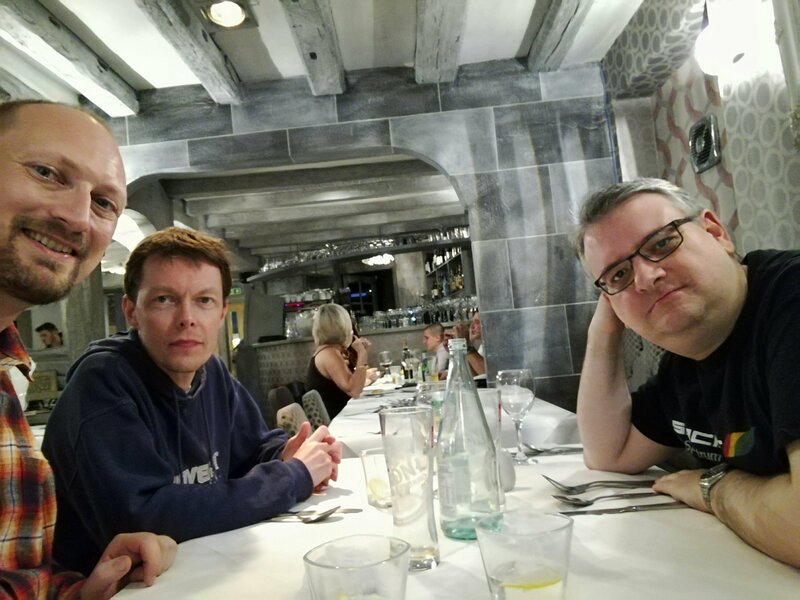 The Demonic Three set off for their afterfest meal in Uxbridge. A fitting end to a magnificent day. Many thanks to everyone who signed my Yath2, and to all those who couldn’t make it this time I hope you will next time.